(Phys.org)—A team of physicists working in a lab at Free University of Berlin have succeeded in causing a quartz cantilever to oscillate uniformly using the random vibrations of a single hydrogen molecule. 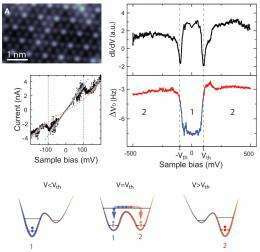 This effect was achieved, the team reports in their paper published in the journal Science, by exciting a hydrogen molecule with electrons and through the use of a crystal that is known for stable oscillations. The team attached a plank shaped piece of quartz to the tip of a probe to create a cantilever. Next the probe was placed near a piece of copper with just one hydrogen molecule between them. A small amount of current was applied to the hydrogen molecule causing it to shift randomly back and forth between two states, creating random noise. That movement of the molecule alternately attracted and repulsed the cantilever causing it to move back and forth while the movement of the cantilever in turn impacted the shifting of the hydrogen molecule. In testing the system, the researchers found that by varying the voltage applied, they could tune the movement of the cantilever causing it to progress to a uniform oscillation. They also found that they could modify the oscillation to produce larger amplitude vibrations – so large in fact that the random movement of a single hydrogen atom could be made to produce movement of an object 1019 times its own size. The system the team built is an example of stochastic resonance, where noisy or random energy is coupled with something else to produce an orderly result. The purpose of such efforts is to find ways to draw useful energy from seemingly chaotic systems in a reliable and systematic way. Stochastic resonance occurs widely in the natural world (generally as energy pumps) providing encouragement to researchers attempting to replicate it in the lab. In discussing their results, the team suggests their experiment demonstrates that a new kind of molecular motor might be built; one that is able to transform random or chaotic energy into predictable coordinated motion at a very small scale. They intend to continue their research to see what other sorts of materials might be used to produce similar results, including replacing voltage with light. Energy harvesting from noise is a paradigm proposed by the theory of stochastic resonances. We demonstrate that the random switching of a hydrogen (H2) molecule can drive the oscillation of a macroscopic mechanical resonator. The H2 motion was activated by tunneling electrons and caused fluctuations of the forces sensed by the tip of a noncontact atomic force microscope. The stochastic molecular noise and the periodic oscillation of the tip were coupled in a concerted dynamic that drives the system into self-oscillation. This phenomenon could be a way for enhancing the transfer of energy from incoherent sources into coherent dynamics of a molecular engine. I question how the word "random" can be applied to a single hydrogen molecule, for which all the available quantum states are known.